Moving out of state at 14 wasn’t much of a choice for Snohomish women’s hockey star Lexi Bender. With no elite options locally, Bender took her game to a Minnesota high school and then Boston College. Now, at 25, she’s an All-Star defenseman with the Boston Pride of the professional National Women’s Hockey League (NWHL) and returns home every year to help lead local clinics for young female players. Meanwhile, in the decade since she left, female hockey participation has exploded locally to where Bender feels Seattle can support an NWHL franchise and further jump-start the local women’s game so players won’t move away. And in the coming weeks, a push to land such a franchise within three to four years will begin with the launch of a “NWHL to Seattle’’ campaign by longtime local hockey fixture Zoë Harris. “I think the market’s right for it,’’ said Bender, who isn’t involved with Harris but has heard league talk about the Seattle lobbying effort. “I know a lot of people are passionate about it and … that’s what we need, people going out there and raising awareness and getting excited about women’s hockey in all different new markets. The NWHL to Seattle campaign comes at a crucial time. The Canadian Women’s Hockey League (CWHL) announced last month it would cease operations May 1 after 13 seasons due to financial pressures, leaving the five-team NWHL as North America’s lone women’s pro circuit. While a “one league’’ push had gained momentum — with star players and even NHL commissioner Gary Bettman suggesting it was best for the women’s game — losing dozens of on-ice jobs wasn’t what anyone envisioned. NWHL commissioner Dani Rylan quickly announced plans to expand to Montreal and Toronto next season and is considering a future broadening beyond. Right now, the league has no Western presence. But with the NHL launching in Seattle in October 2021, those connected to women’s hockey locally feel it’s time for NWHL expansion here and to potential rival Vancouver. For now, Harris, 48, a former University of Washington men’s hockey coach and builder member of the American College Hockey Association Hall of Fame, hopes to drum up interest. She recently forwarded “NWHL to Seattle’’ publicity plans to commissioner Rylan explaining the campaign and suggesting this city play host to a women’s All-Star Game. Harris sees “a tremendous opportunity for synergy” with the Seattle NHL team and plans to seek their help bringing an NWHL franchise here. She feels the now-$80 million planned NHL team training center at Northgate Mall, with a main rink capacity of 1,000 spectators, is right in the NWHL’s sweet spot after it averaged 954 fans per game this past season. “It’s a perfect, intimate environment where you’d get sellouts and the place would be rocking,’’ Harris said. After offering $10,000 to $25,000 per season to players in Year 1, the NWHL scaled back to a $100,000 yearly salary cap and wages reported by news sources at between $2,500 and $10,000. Lake Stevens resident Kristie Minkoff, 56, for years was business manager of the newly crowned NWHL champion Minnesota Whitecaps when they were a “pay to play” independent franchise. In fact, Minkoff, who returned here from Minnesota in 2015, was flown to St. Paul by the Whitecaps — a first-year NWHL entry — for last month’s Isobel Cup championship. She said her biggest challenges were sufficient corporate sponsorship and media exposure so sports fans were aware of the team. And that remains her concern about viability here. She said it was tough enough making a women’s team work in hockey-mad Minnesota, let alone in Washington, where the sport isn’t as mainstream. The Whitecaps were a first-year NWHL success story, which Minkoff attributes to a strategic partnership — mostly promotional and marketing support — with the NHL Minnesota Wild and using the team’s TRIA Rink training facility in downtown St. Paul. They sold out all 10 games at the 1,200-capacity venue. 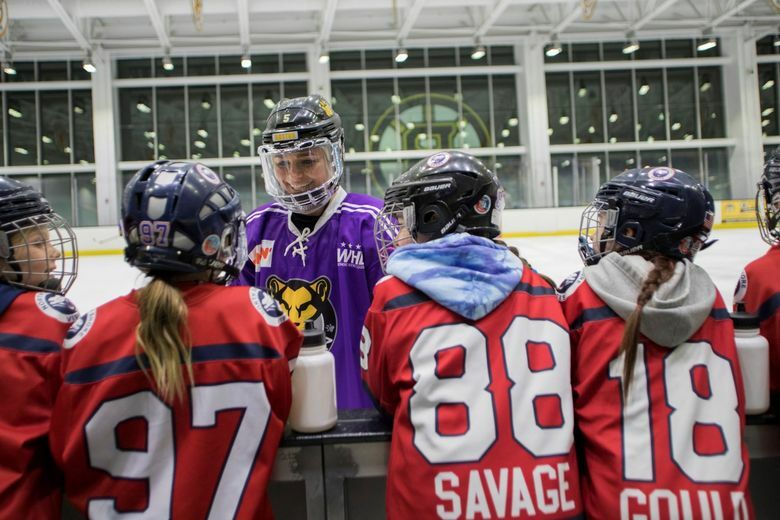 Three other NWHL franchises, the Pride, Buffalo Beauts and the New Jersey-based Metropolitan Riveters, have strong connections to local NHL teams. The Beauts, who averaged 1,101 fans per game, are operated by the Pegula family that owns the Buffalo Sabres while the Pride and Riveters have strategic partnerships with the Boston Bruins and New Jersey Devils. The NHL also provides an undisclosed five-figure annual subsidy to both women’s leagues and is doubling it for the NWHL after the CWHL’s demise. Harris, in launching her “NWHL to Seattle’’ campaign, hopes the incoming NHL franchise and local business and community leaders help make the women’s game more visible. She agreed that without enough media exposure, an NWHL team won’t stand a chance. She noted that, according to USA Hockey data, women playing hockey in the Pacific district — comprised of Washington, Oregon, California, Nevada and Alaska — jumped 46 percent from 4,595 to 6,702 the past five years. After the inaugural NWHL season in 2015-16, Northwest district registrations for girls 8 and under climbed 65 percent in one year. Pride star Bender has made frequent guest appearances in the Seattle area at youth skates and clinics. She and teammates also do similar work in Boston, where they averaged 706 fans per game at the NHL Bruins’ 1,200-seat suburban practice facility. As a fourth grader, her father — who’d played hockey in Alaska — during a family vacation took her to Conte Forum where the Boston College women’s team plays. She couldn’t believe a women’s team played at the 8,600-seat facility and knew right then where she’d be attending college. Her dad previously arranged for her to meet Brooke Whitney and Kelly Stephens, two Seattle-area hockey players who’d left the state and achieved elite success elsewhere, to keep Bender inspired. Back then, she played boys youth hockey until breaking her collarbone. The move to Minnesota followed. “It was kind of eye-opening that I needed to leave to pursue the female level,” Bender said. “But now, if I come home and they ask me ‘Hey, do you want to put on some skates and go to a youth program?’ I’ll probably get more girls out for a last-minute skate than there were playing back when I was coming up. Young players who, if this NWHL to Seattle push succeeds, could have the next generation’s female role models in their backyard.